If you make things and sell them, you do better over time than if you borrow to buy things. If you send jobs and factories out of the country, you end up with devastated cities like Baltimore. Sure, a few people get rich from that, but 99 percent of us get poorer. How hard is it to see that? 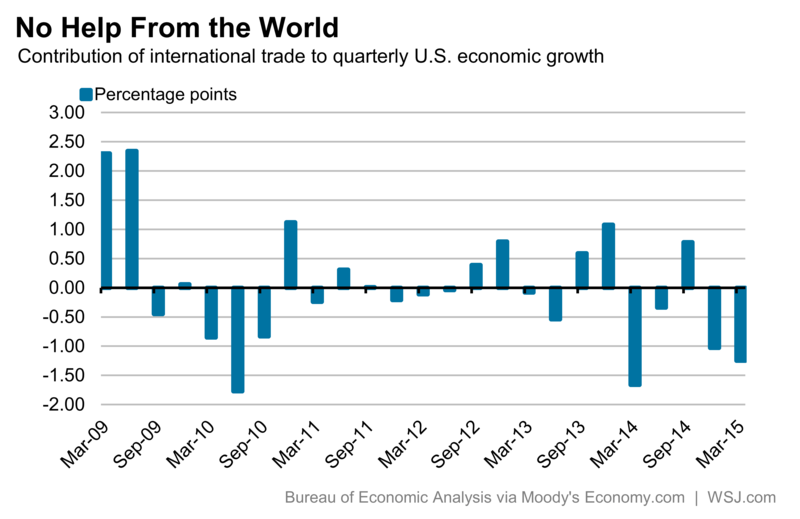 You may have heard that gross domestic product growth was dismal in the last quarter. You may have heard that there were riots in Baltimore. You may not have heard that these are both at least partly caused by our enormous, humongous and continuing trade deficit. A trade deficit is when we import more than we export. It means that there is a certain level of demand in our economy, but some of that demand is leaking out to other countries. When this deficit is significant and goes on for a while it means that jobs are lost, factories close and we get poorer. 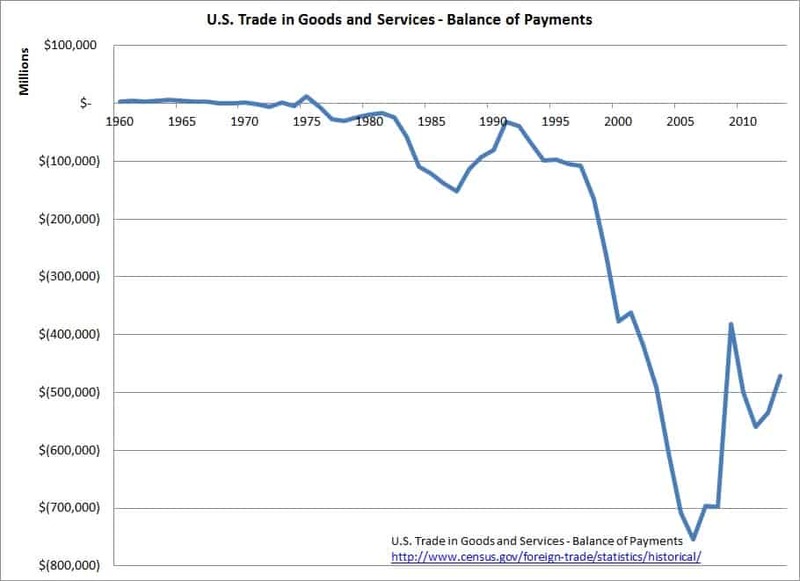 We started having trade deficits in the late 1970s with the ascension of free-market, free-trade ideology. We have continued to have trade deficits every single year since, and they have grown into the hundreds of billions. So … millions of jobs, tens of thousands of factories, trillions of wealth … gone. You can see the result in Detroit, Cleveland, the “Rust Belt,” towns full of boarded-up houses and empty storefronts – and the economic devastation and desperation that leads to what we see playing out this week with riots in Baltimore. An important analysis of our situation appeared this week. Robert Reich wrote about how our system is rigged against us, lowering wages and causing terrible insecurity. Underneath that insecurity is the widespread fear many of us have that we could end up facing the hopelessness of the people trapped in places like Baltimore and Detroit (and city after city after city devastated by year after year after year of decline as we ship our jobs and factories away…). For example, some of their economic insecurity has been the direct consequence of trade agreements that have encouraged American companies to outsource jobs abroad. 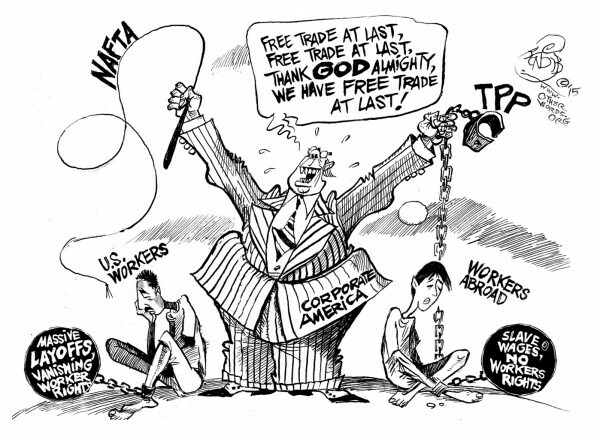 Since all nations’ markets reflect political decisions about how they are organized, so-called “free trade” agreements entail complex negotiations about how different market systems are to be integrated. The most important aspects of such negotiations concern intellectual property, financial assets, and labor. The first two of these interests have gained stronger protection in such agreements, at the insistence of big U.S. corporations and Wall Street. The latter—the interests of average working Americans in protecting the value of their labor—have gained less protection, because the voices of working people have been muted. The downward pressure on wages was the deliberate outcome of government policies designed to put U.S. manufacturing workers in direct competition with low-paid workers in the developing world. This was a conscious choice. Our trade deals could have been designed to put our doctors and lawyers in direct competition with much lower paid professionals in the developing world. We are not investing in maintaining – never mind modernizing – our infrastructure. We keep cutting back on science and health research and education. These are basic investments in our economy but are derided as “government spending” as if the function of our government shouldn’t be to do things that make our lives – and economy – better. Look at what is happening in Baltimore, where desperate people and hopelessness combine until a match is lit. We have to change this. We have to demand we balance our trade and invest in our people and economy again. We have to demand political leadership that responds to us, not just wealthy donors. This country is not intended to be a plutocracy of by and for the rich; it is intended to be a democracy of by and for We the People.